Out of an electoral register of 20.5 million, Maduro won 6.2m votes, down from 7.5m in 2013. The main opposition challenge came from Henri Falcon, who received 1.9m votes on a programme of dollarisation that promised immediate payments of $25 per adult and $15 per child, doubling the minimum wage with salary and pension payments made in dollars. His leaflets were designed to look like dollar bills. Falcon’s programme would have been funded by the IMF in return for a severe ‘structural adjustment’ programme that slashed public spending. But the Venezuelan working class rejected the tantalising promise of dollars. A vote for Maduro was a vote for the continuation of the Bolivarian revolutionary process, which has channelled oil revenues into social programmes and driven participatory systems of self-government in working class barrios known as comunas. Its massive gains include free universal health care, pensions, the tripling of university enrolment and the construction of over two million units of social housing. Despite the pressure of runaway inflation and material shortages, six million people voted against imperialist intervention and in favour of sustaining the fight for socialism. Inevitably, Falcon cried fraud and called for new elections to be held in October. Venezuela has one of the most robust secret ballot systems in the world. Voters present their fingerprint on automated machines, preventing identity theft or double voting, and tally the decision with a printed receipt which is deposited in a ballot box. The automated results are validated through a public manual count of 54% of all ballot boxes. Though the bourgeois media peddles the lie that international election observers are barred from Venezuelan elections, a mission led by the Council of Electoral Experts of Latin America reported that they had not observed any element that could disqualify the process. They stated that ‘these elections must be recognised, because they are the result of the will of the Venezuelan people’. The vote was accompanied by more than 150 observers from 30 countries. MUD attended internationally-mediated talks and agreed a spring schedule for early presidential elections – a central demand of the opposition for two years. However, at the last minute MUD withdrew – reportedly at the behest of the US State Department. When in February Maduro announced Venezuela would pursue the provisionally agreed schedule, President Trump declared the election illegitimate and imposed more sanctions. The MUD, beneficiaries of over $49m from the US for ‘regime change’, dutifully followed suit and announced a boycott of the election. When Falcon split from the MUD and launched his own presidential bid, the US pressured him to drop out. What the imperialists want is for Venezuela to follow in the footsteps of Brazil or Honduras, with a parliamentary or military coup restoring a pliant neo-liberal government. Given the strength of Venezuela’s social movements, comunas and workers’ organisations, this would require a complete break with the Venezuelan constitution, smashing participatory democracy and launching a bloody attack on working class organisations. Clearly Venezuela’s economy is under enormous international pressure. However the PSUV has failed to take decisive action against the domestic private sector, and the gaping chasm between the fixed exchange rate and the parallel unofficial market is taking its toll. The lowest official rate pegs 10 bolivars to the dollar for imports of food and medicine, whereas on the parallel market one dollar sells for 80,000 bolivars. Since 2017 food prices have increased over 22,000%. Although wages have been periodically increased, such rapid price-hikes far outstrip purchasing power which has collapsed an estimated 90% in the last year. A national network distributes food parcels to over six million people, but even this has become erratic. After nearly 20 years of the Bolivarian revolution, 70% of the economy remains in private hands. Though state oil exports generate 97% of foreign currency, the private sector still controls the main levers: imports, banking, food distribution, industry. Powerful monopolies are engaged in a vicious economic war, sabotaging production and boycotting supply. Despite the private sector’s minimal contribution to exports ($2.7m in 2012) the PSUV continues to hand over billions of ultra-subsidised dollars for imports rather than seize control of foreign trade itself. With the bolivar massively over-valued, parasitic capitalists devise elaborate scams to accumulate dollars: over-invoicing, import fraud, smuggling rackets and speculation. Spending on imports doubled from $15.7bn in 2004 to $30.8bn in 2014 with $7.7bn spent on food alone. Yet this money has been squandered and stolen, with deposits of dollars abroad by the private sector increasing by 232%. Though Maduro has launched a commendable drive against corruption, with over 80 executives in PDVSA and its subsidiaries arrested, the problem goes beyond a few bad apples. Venezuelan economist Manuel Sutherland from the Workers’ Training and Research Centre (CIFO) estimates that for every $10 the government sells to the business sector for imports, $9 are stolen. Between 2004 and 2014, for example, money for coffee imports increased by 8,200% – while the coffee shortage index soared to 94%. Coffee was hoarded in warehouses, sold for ten times its fixed price on street stalls, smuggled out of the country or never actually imported in the first place. Likewise, multinational pharmaceuticals Pfizer, Merck and P&G increased their import invoices ten-fold yet decreased their imports by 87%. Sutherland argues ‘For more than six years we have argued the need to nationalise banking and all foreign trade to prevent the deepening of this scourge that impoverishes the nation in a radical way’. He adds: ‘The socialist revolution is a social break in which the bourgeoisie loses all its political-economic power and the working class gains that power, destroys the capitalist state, builds the workers’ state, expropriates the means of production and reorganises social relations eliminating the private appropriation of other people’s work... That has not happened here.’ Given the resulting inflation and scarcity, and with no revolutionary leadership from the PSUV, it is no surprise Maduro received fewer votes. Compounding the problem, oil production is now a fraction of previous levels. Though prices have recovered from their low of $35 per barrel, Venezuela’s oil production has contracted from 2m bpd in 2014 to less than 1.5m bpd this year. Carlos Mendoza Potella, an oil expert at the Central Bank of Venezuela, explained that when oil prices were high, the focus was on untapped reserves of extra-heavy crude in the Orinoco delta, neglecting the established oil fields of light shale in Maracaibo which desperately need updating. Heavy crude is expensive to extract and only worthwhile if oil prices remain high and diluent liquids for blending are easily available. Venezuela’s imports of diluents come from the US and may soon be suspended. Worse, Conoco-Phillips has won a court case in the US authorising it to seize PDVSA assets in the Caribbean and forcing Venezuela to repay $2bn as a result of a 2007 nationalisation. develop chains of industry and distribution. Any drive to deepen the Bolivarian revolutionary process and solve the economic crisis in the interests of the working class will depend on strengthening the participatory democracy of the comunas. There is clearly a battle within the PSUV between those attempting to drive this project forward as a step towards socialism, and those who want to hold it back. Angel Prado, a high-profile community activist barred from standing in December’s municipal elections by anti-democratic forces within the PSUV argues that: ‘The project of Chavez (founder of the Bolivarian revolution who died in 2013) was socialism, right?…the political leadership of the government is making a shift towards a mixed, centre-left project, where economic stakeholders have their privileges guaranteed…I believe that what’s coming is the resistance of pure Chavismo not to give in to the intention by some in our government to roll back the project of Chavez...we [need to] organise as communities and devote ourselves to produce and acquire a certain political level that allows us to understand that the solution to most of our problems is in our own hands – building our power’. The extent to which Plan 2025 is successful will be determined by the outcome of the battle between these opposing trends. 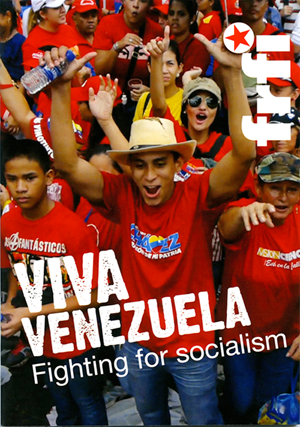 As sanctions bite and international pressure mounts, our role in Britain must be to stand with those fighting for socialism in Venezuela. The bloody history of imperialist intervention in Latin America shows the repression, brutality and fascism unleashed on the working class following the overthrow of progressive governments. Hands off Venezuela!